Word will normally print to the default Windows printer, though you can set an alternative 'active printer' which will remain the printer Word prints to for the current session, or until changed to another. Where you have more than one printer - e.g. a laser printer for draft work, a colour printer for photographs, or maybe a fax driver - and you regularly switch between them; you can lose track of which printer the document will be sent to. You can get around this by creating a 'printers' toolbar with buttons to call a macro, similar to that shown below, for each printer. Clearly each macro will have to have a unique name. For Office 2007 and later you could add the buttons to the QAT (Quick Access Toolbar) or to a ribbon tab. See also the companion web page which demonstrates the storage of the printer name with the document and offers the possibility of printing to that stored named printer. .Printer = "Put the name of the required printer here"
If the printer has switchable trays, and you always wish to print from a specific tray, then the code may be modified slightly to select the required option. 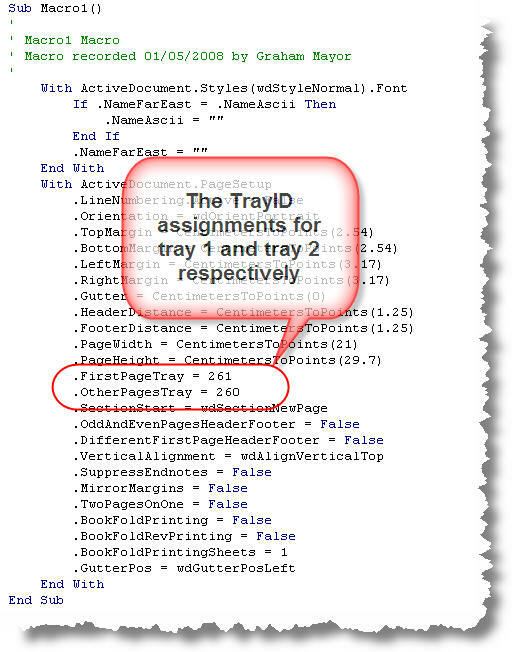 There is however an issue with using the tray assignments by name. If an error occurs when setting the option Word 2003 crashes and Word 2007 ignores the assignment. To ensure that this works correctly, it is much better to use the DefaultTrayID number. If you don't know the Tray ID numbers for your printer (and why should you) ensure that Word is configured to use the printer in question, then record a macro setting the Page Setup including the required tray assignments. In the illustration below I have chosen Trays 1 and 2. Different printers have different tray IDs, do not rely on the ID numbers shown in the examples working in every case. Use the method above to check the ID codes for your printer. Options.DefaultTrayID = "Set the trayID option here "
To demonstrate, I have chosen a couple of real world examples, using Windows Fax and an HP 4050 postscript printer. ActivePrinter = "HP LaserJet 4050 Series PS"
The previous examples simply swap the printer and print the document without user interference, but you may wish to display the print dialog box to set print options for the current task. This requires a slightly different approach. Some users have a variety of printers available (or not) at different times. You may wish to locate whether you have a suitable printer available, for example a colour printer, for a specific print task and print to that. The following macro requires the code by Astrid Zeelenberg at Get Available Printer Names to list the available printers in an array. You can then use this array to check whether the printer you need is available and then print to it. In the following example, I have checked to see if the array contains a printer with the word COLOR in the printer name having converted the printer names to upper case for consistency. If the routine finds such a printer name, the routine sets that printer as active printer and prints the document to it, before returning control to the original printer. If there are no printers available or no printers that match the required condition, pop up message boxes inform the user and the document is not printed. MsgBox "No color printer available"
Some users may wish to employ separate printers or trays for printing envelopes and labels. When using an envelope printer - here shown as the HP LaserJet 4050 Series PS - it is probably best to use envelope templates and the techniques already shown to print envelopes. If the wizard is used to add an envelope to a document, the envelope printer will no longer be applied. 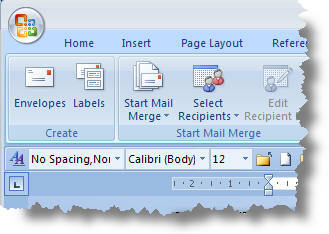 Word 2007/2010 have separate tools for envelope and labels on the Mailings tab, so requires a separate macro for each. If you only wish to change the printer setup for one of the functions then simply create only the macro you require. 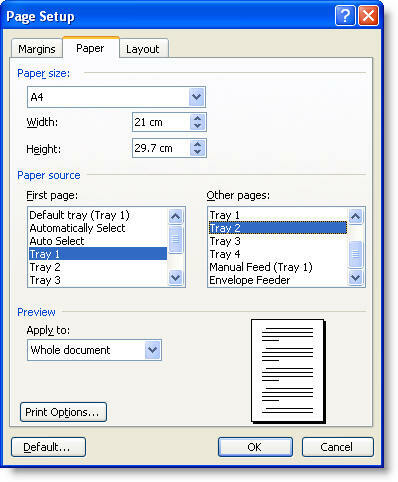 Although earlier Word versions had access to the same envelope and label dialogs, they were called from the same menu entry, and while it should be possible to separate them, it doesn't seem worth the effort, so the following macro pops up a dialog to allow the user to choose envelopes or labels before setting the appropriate printer and displaying the correct dialog. If you do not know how to employ the macro code, see the tutorial elsewhere on this site. The following illustrations are for Windows XP. Windows Vista provides fax software in only certain business orientated versions. For other versions, you would have to consider upgrading or applying third party software in order to provide fax functionality from Word.. Check the Fax Services item and click 'Next' to install. Select Printers and Other Hardware from Control Panel then View installed printers or fax printers. Choose your modem and set its properties to your requirements. Despite the URL of this page, faxing from Word plays only a cameo role at the end of the page. Instead the page concentrates on printing to different printers and trays.